Yesterday I got a HD4850 card from post and happily installed it to my desktop computer. I noticed that my 15″ secondary monitor was not detected, but I ignored it until today. Working with two monitor is so much easier and faster, so I started to investigate problem. After trying with several dvi cables and with my laptop I came to the conclusion that displays EDID information is too old or its corrupted when changing gpu card. I knew that every displays have eeprom or edid data for each connector, and GPU reads it over display cables clock and data pair. 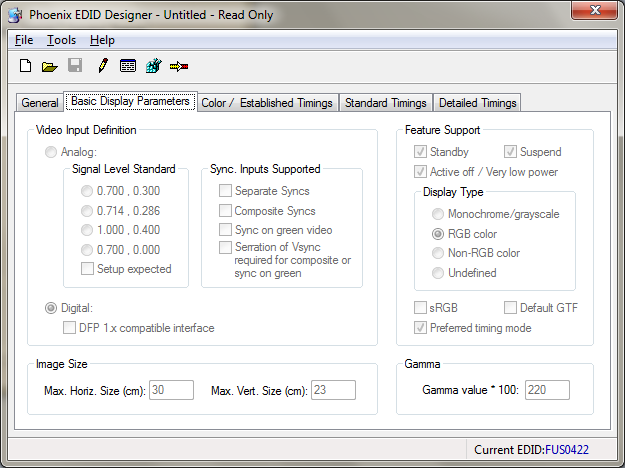 I were able to edit edid data with this Phoenix EDID Designer. My desktop nor my laptop couldn’t detect display with dvi connection, but vga still worked, so I extracted edid from registry, and changed connection to dvi and checked timing from another 15″ LCD which had working dvi connection. Then I had to somehow flash the broken display. I don’t have bus pirate or any other usb i2c adapter or 24Cxx (which is eeprom used in displays and many other places) programmer so I had to improvise. Fist I had avr in my mind, but coding program to program eeprom is bit too trivia for me. Then I remembered a program called ponyprog (ugh, i don’t like ponies at all) which can program these eeproms and supports several serial and parallel adapters. 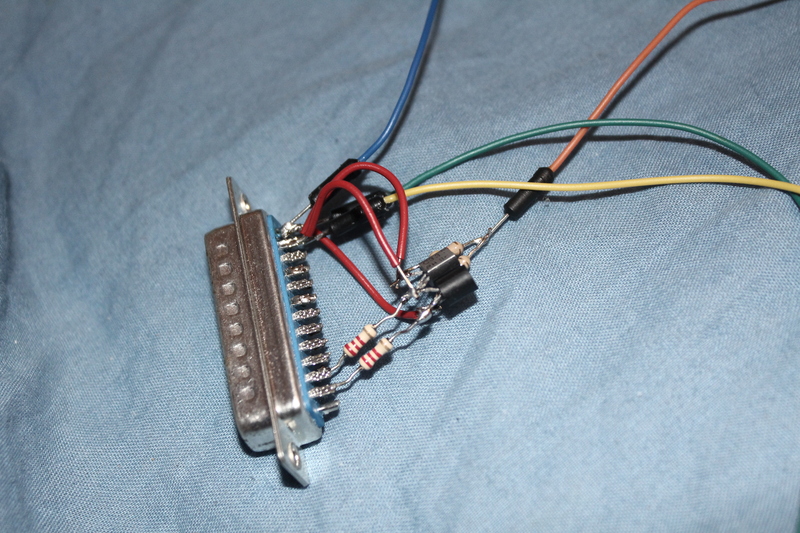 I made this simple adapter quickly soldering parts straight to lpt connector. Ugly but worked as long as needed. In dvi connector I2C SCL signal is pin 6 in dvi connector and pin 7 is SDA. Pin 14 is used for 5v and 16 can be used for ground among other. I connected adapter to display and booted my old trusty T42 which have old style parallel port. Ponyprog detected chip with first try. I writed FUS0422.hex file which I previously had exported with phoenix tool to displays eeprom and tested display. And picture came \o/. You can download also other ponyprog eeprom images that I read from display. 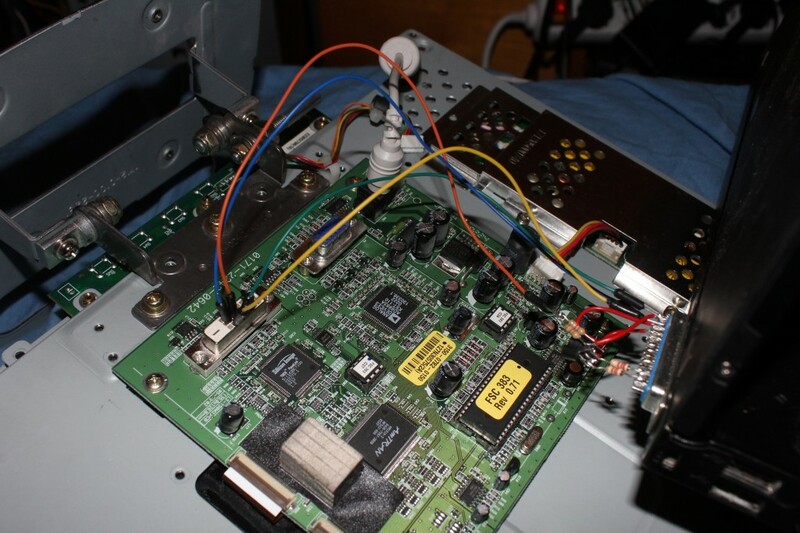 There is couple setting IC:s and original vga and DVI edid data. Edit: Oh, I forgot to mention the model of display, its Fujitsu Siemens 383V FA without plastic case. I have other LCD:s but this have best picture quality.